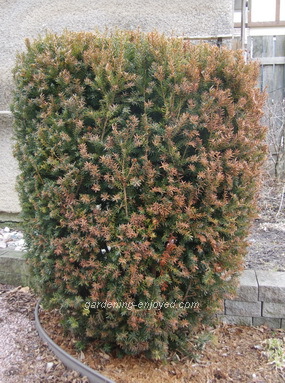 Dallying In The Dirt, Issue #211--- Taxus burn is a cold winter indicator. The sun actually shone and it felt a bit warm so I ventured outside to see what chores I might be able to undertake. I got the bubblers running in the ponds again. The ground fault had been tripped, probably when the power to the garage was ripped off by the heavy icicle. All of the fish seem to have survived and are slowly swimming about near the bottom. Water is at its heaviest at 4.4 C (40F) and that means the water at the bottom of the pond is usually around that temperature despite the layer of ice on the top. 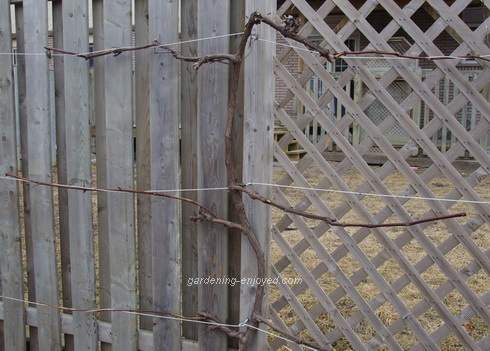 I took my newest Fiskars pruners and wandered out to the grape vines. The soil in the garden was quite mucky but only on the surface as there was still significant frost in the ground making it quite firm enough to walk on. The Grape Vines were treated to their winter hair cut. I have to remind myself each year just how much vine must be removed. I need to leave 4 - 5 buds on each branch to produce this year’s fruit and that means cutting off close to 90% of the vines. Into the brown compost bag it all went and the vines now look neat and tidy and ready to burst into leaf if the weather ever warms up. I’m looking for some new vines to plant this year that will produce seedless grapes. Sheridan Nurseries lists a few on their web site such as Himrod, an early white seedless variety or Vanessa a later, red seedless variety. Both of these should be hardy in our area. I’ll be checking the local store for their arrival. All winter my lovely upright Hick’s Yew has been a beacon of dark green needles at the entrance to the back yard path. Suddenly in the last week or so it has changed colour. Yew, Taxus spp. are very hardy evergreens and I never make any effort to provide winter protection for them. The entire south side of my shrub is now a dead brown colour. It survived all winter but the deep cold has contributed to its damage. It was thoroughly watered in the fall to make sure that it had a reservoir of water for the spring. The bright sun of the early spring has shone on its south side, waking up the needles and starting the transpiration process. That’s water leaving the leaves and drawing up fresh water filled with nutrients from the soil. That second part is not happening because of the deep late frost. The needles are giving off water and can’t replace it and that fries them to that rich brown colour that is now showing up. This Yew has been happy in that location for several years with no winter damage at all. Just another indicator of how much colder this winter has been. Mother Nature continues to show me her latest tricks and teases. One good experience outside and one bad one and then the cold weather drove me back into the basement. 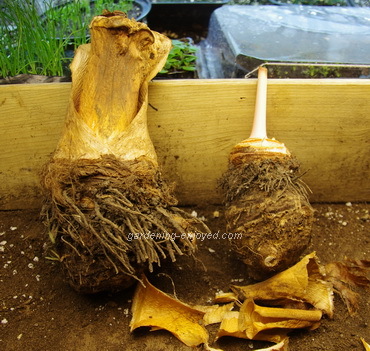 Last week we looked at our Tuberous Begonias and this week we are going to dig into that pile of dead looking lumps and leaves and find the Colocasia tubers. The base of last year’s outer leaves are still there and they have turned brown and shriveled making the tubers look distinctly dead. A little careful peeling and pruning reveals a nice firm pink tuber that is all ready to plant. The have very rambunctious roots so each one needs a deep pot to start in. The tubers are planted so that about 90% is in the soil. Just the pointy bit at the top is sticking out and that’s where the new leaves will emerge. They do need to be put in quite a warm spot, they are a tropical plant, in order to get them to wake up and start growing again. Space, as usual, becomes an issue. They multiply during the summer and of course we save every tuber, big or small, and that means we need more space each year. I’m afraid to mention that I might compost some of them because, last week, when I mentioned composting some of my seedlings a few of my gardening friends called and suggested that I should have called them and shared instead. Sharon Asks? Last summer I visited your amazing garden ,I would like to try the potatoes in a pot ,can you advise where and when to purchase ? Ken Answers! I buy mine from Eagle Creek Seed Potatoes. Vivian Comments With regards to Spencer who wrote in about the mini greenhouse: Please warn him about the plastic cover that fits over the 4 shelves.....that the warmth of spring....the winds of spring...the strength of the sun.... and most importantly the cheapness of the zippers and seams on the plastic flaps don't last for long. I made one plastic cover last for 2 years with the help of clothes pins and duct tape. I even called the manufacturer to ask if I could purchase another plastic cover and the answer was yes........but it would be cheaper to buy another whole new set at $30.00 from Lowes or Home Depot. So to make a long story longer, I have 3 frames and no zippered plastic covering this year. I realize that $30.00 won't exactly break the bank, but I don't need the metal frame and shelves...I just need the plastic. I remove the plastic every fall and put it in my warm basement...but it still is extremely damaged due to the elements of spring. So Spencer...good luck with your mini greenhouse. I just love them, but the manufacturer should supply the stores with just the covers. Thanks for letting me vent!! I feel so much better. I also realize there are more pressing problems in the world than this. I will survive.....and so will my seedlings!! Ken Answers! Thanks for the review Vivian. Susann Asks? Hi Ken, another burning question ... what is up with my 16 year old Alberta Spruce trees getting brown dead spots on them? The damage is close to the top and on the east side of the tree ... do I cut the dead branches out? Ken Answers! Burning question, exactly. You can see the problem above with my Yew.